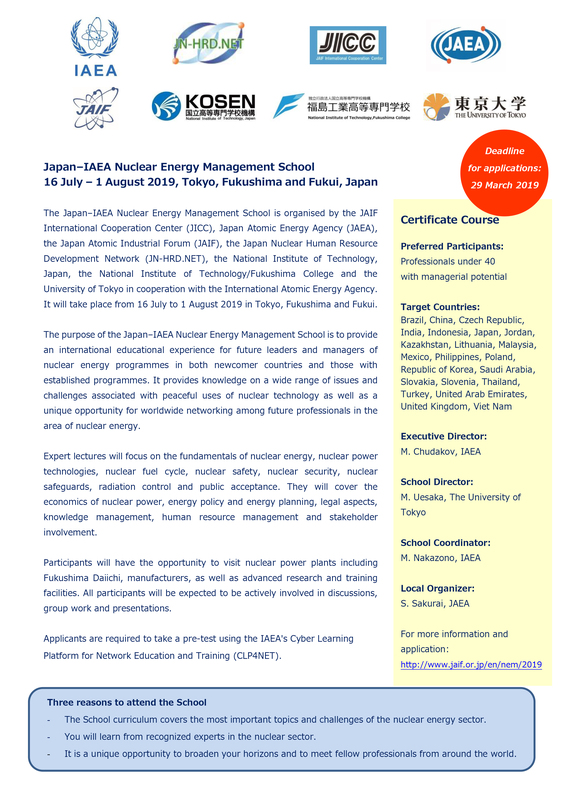 The Japan–IAEA Nuclear Energy Management School is organised by the JAIF International Cooperation Center (JICC), Japan Atomic Energy Agency (JAEA), the Japan Atomic Industrial Forum (JAIF), the Japan Nuclear Human Resource Development Network (JN-HRD.NET), the National Institute of Technology, Japan, the National Institute of Technology/Fukushima College and the University of Tokyo in cooperation with the International Atomic Energy Agency. It will take place from 16 July to 1 August 2019 in Tokyo, Fukushima and Fukui. The purpose of the Japan–IAEA Nuclear Energy Management School is to provide an international educational experience for future leaders and managers of nuclear energy programmes in both newcomer countries and those with established programmes. It provides knowledge on a wide range of issues and challenges associated with peaceful uses of nuclear technology as well as a unique opportunity for worldwide networking among future professionals in the area of nuclear energy. Expert lectures will focus on the fundamentals of nuclear energy, nuclear power technologies, nuclear fuel cycle, nuclear safety, nuclear security, nuclear safeguards, radiation control and public acceptance. They will cover the economics of nuclear power, energy policy and energy planning, legal aspects, knowledge management, human resource management and stakeholder involvement. Participants will have the opportunity to visit nuclear power plants including Fukushima Daiichi, manufacturers, as well as advanced research and training facilities. All participants will be expected to be actively involved in discussions, group work and presentations. Applicants are required to take a pre-test using the IAEA's Cyber Learning Platform for Network Education and Training (CLP4NET).